UNCOMFORTABLE MOMENTS: The Snacking and the Damage Done. I encountered this bit of Successories-style wisdom as I was contemplating my fourth (snack-size!) bag of Party Mix today. Party Mix has been my master for about three years now. Like many addicts, I'm not sure exactly when or how it got so bad. It all started innocently enough, with a trip to the vending machine in the cafeteria at work. At that machine I found the pefect antidote such dire circumstances as being in an office at 4 p.m. "Can't decide between Cheetos, BBQ Fritos, Doritos, pretzel rounds or tortilla rounds? Well, why not enjoy them all in one glorious snacking power play?" That's what the Party Mix bag said to me, and I heeded the call. It never seemed to matter that I always felt a little ill after eating it. It didn't matter that I never saw another human buying it or consuming it. All that mattered was how the crunchity saltiness seemed somehow to take away the pain for a few minutes. The problem only worsened when I left one job for another, trading my old "dealer" (which stocked Keystone) for a new vending machine, where the Party Mix was of the Utz variety (higher quality, with a reassuring "0g Trans Fats!" label) and the bags were bigger and more expensive. The seating arrangement at my office in D.C. lent itself to easy daily scrutiny of eating habits, and it wasn't long before it became clear to my coworkers that I was unable to get through an afternoon without eating a bag of P.M. I tried to kick by using other snacks -- Soy Nuts, Sun Chips -- but those were to Party Mix what O'Doul's is to Guinness. One podmate was particularly good at giving me a chuckling look when I would try to return nonchalantly to my desk with the sodiumtastic combo of P.M. and D.C. (Diet Coke) in hand. It was a look that said "I see you," and "Oh, you poor thing," and "Your lack of discipline is endlessly amusing." My only consolation was that through sheer force of daily exposure to me, she too became addicted (though not as badly) and I could know I was not alone. When I left Washington and moved into an office with a P.M.-free vending machine, I thought my long struggle was finally over. I could now feel what it was like to enjoy an afternoon without red 40 lake, disodium guanylate, "natural smoke flavor" and the other mystery ingredients with which I had been poisoning myself five days a week. I was not to taste that freedom. 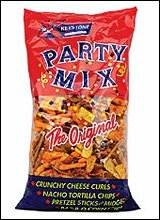 Within a week of my arrival, a case of 60 bags of Party Mix arrived from Utz Quality Foods, Inc., courtesy of my former D.C. podmates (or "enablers") -- a gesture that proves what a thin line it is between love and hate. I tried to explain to my new S.F. coworkers why a huge cardboard box teeming with purple snackfood bags was at my desk, but they seemed to find it more disturbing than amusing. How many bags does it take before you have to scrape the salty, cheesy orange crud off of your finger tips? That's my favorite snacking hazard!